Meet your family's new favourite weeknight dish: a burger made with extra-lean ground beef transformed into a cheeseburger, thanks to a topping of mac and cheese. Prepare Kraft Dinner as directed on package. Meanwhile, remove bread from centres of cut sides of bun tops; discard or reserve removed bread for another use. Shape meat into 6 (1/2-inch-thick) patties; cook in skillet on medium heat 5 min. on each side or until done (160°F). 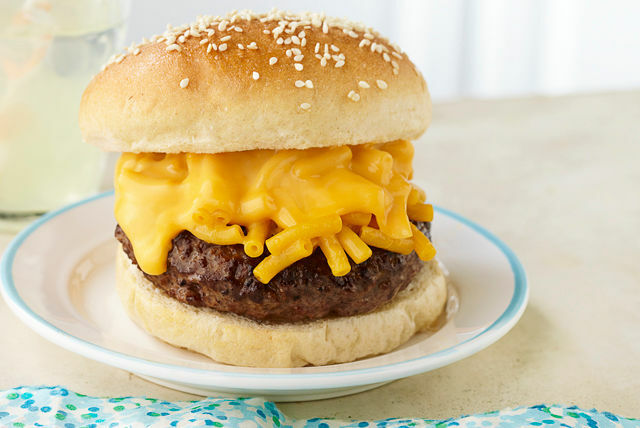 Place burgers on bottom halves of buns; top with Kraft Dinner and Kraft Singles. Cover with tops of buns. Top burgers with your favourite condiments, such as Heinz Tomato Ketchup and Heinz Yellow Mustard, before covering with the prepared Kraft Dinner. Toast buns before using as directed. Blend removed bread in blender or food processor to form fine crumbs. Store in freezer-weight resealable plastic bag in freezer until ready to use in your favourite recipes, such as meatloaves, meatballs or casserole toppings.